SQL NOT EXISTS helps select rows from a table which are not present in another related table (or in the resultset of a subquery). SQL NOT EXISTS return TRUE if the subquery does not return any row. 2.1 What we learned today about SQL NOT EXISTS operator? Let us consider the student_t and library_log_t table we had used in SQL EXISTS. SQL Queries #1: We will find out the student details from the student_t table who do not have respective row present in the library_log_t table. So the NOT EXISTS Query for the same would be as follows. SQL Queries #2: We can also use table aliases concept to make the query short and readable. Result: Same as SQL Queries #1 example. SQL Queries #3: We can also use SQL NOT IN operator and it will solve our purpose too. Here is the query which uses NOT IN instead of NOT EXISTS. What we learned today about SQL NOT EXISTS operator? 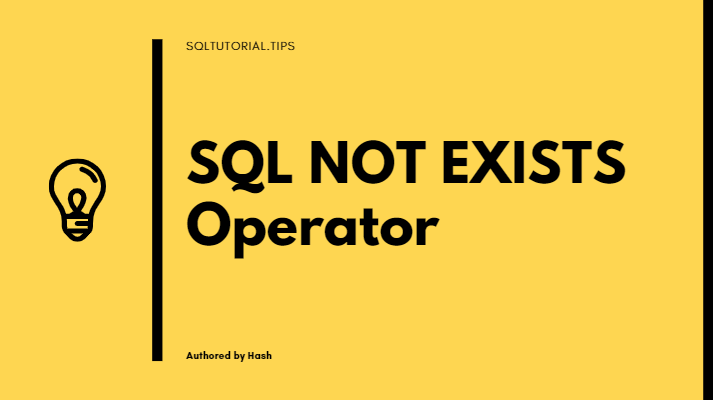 SQL NOT EXISTS is the negation of the SQL EXISTS Operator. Just like SQL EXISTS queries can be re-written using SQL IN operator, we can use SQL NOT IN operator to re-write SQL NOT EXISTS queries.